Zucchini lasagna is a gluten-free meal that’s lower in carbs and packed with flavors and textures. You’ll never even realize it’s missing the lasagna noodles! 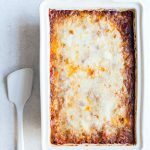 This easy zucchini lasagna recipe also freezes well, making it a quick last minute dinner option (something I need to throw together more often than I’d like to admit). 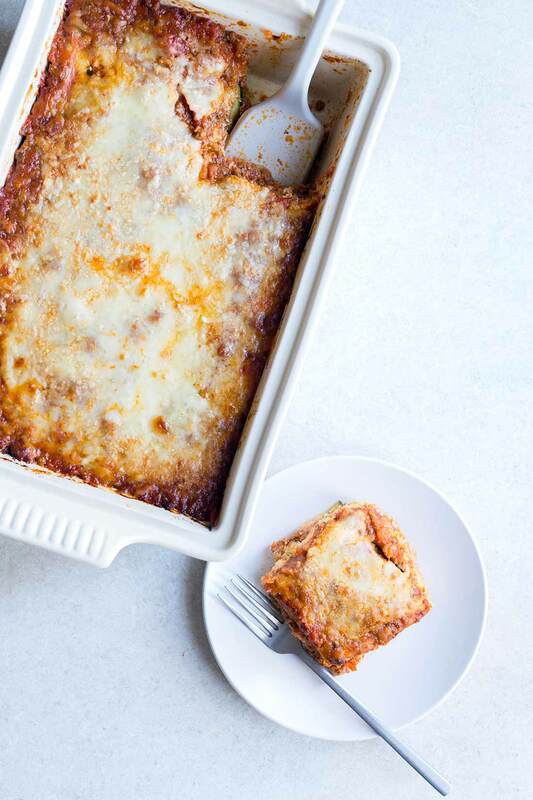 There are so many reasons to love homemade lasagna. Especially this zucchini lasagna. For starters, it’s something that can be prepared in advance and then baked off right before show time. This makes it an excellent option for serving guests, or for preparing on a Sunday so that dinner is ready to throw in the oven after work on Monday evening. It also freezes well in individual portions, meaning you have meals for the rest of the week! 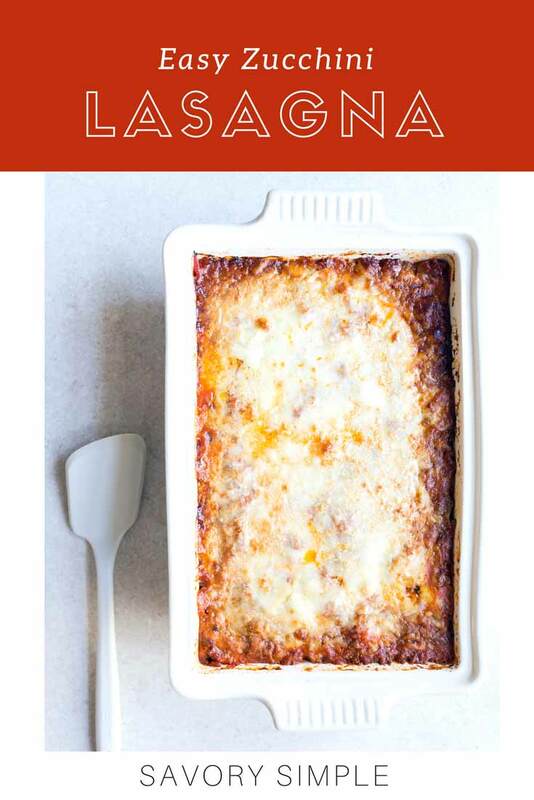 While I love a classic lasagna, there’s no denying it’s heavy. I can only eat a small amount before feeling full. This is why I’ve become a huge fan of swapping out the noodles, as I’ve done here and also with my eggplant lasagna. These recipes are so much lighter, yet still hearty and satisfying. You can slice the zucchini by hand, but this is one time where I love having a mandoline. It gives me perfectly even, thin slices in seconds. When salting the zucchini, you need very little salt to extract the water, around 1/2 teaspoon per pound. It’s tempting to add more, but too much salt might leave you with salty zucchini even after a good rinse, resulting in a salty lasagna. I may be speaking from experience. Unlike my eggplant lasagna, which is vegetarian, I’ve added lean ground beef to this version for more of a protein kick. You could swap the ground beef for Italian sausage, or do a combination of both (my homemade meat sauce would work perfectly here; you’d want to increase the sauce amount to around 3 1/2 – 4 cups and omit the beef from the ingredient list). If you want protein, I’m a fan of Field Roast Italian Sausages and the soy chorizo from Trader Joe’s. You could use firm tofu (the kind packed in water, not silken), but make sure to press ALL of the water out of it before using. 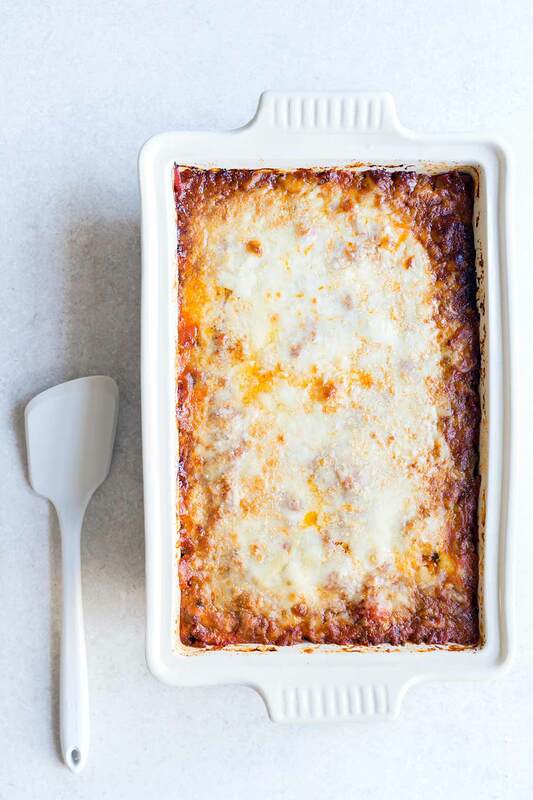 For a veggie lasagna, replace the meat with 2 cups of your favorite sautéd vegetables. You can mix them right into the marinara sauce. If you’re using a watery vegetable (like mushrooms), make sure to cook out the liquid first. Love this Zucchini Lasagna? Then you should definitely check out my Mexican Tortilla Casserole, Cincinnati Chili, and Crispy Baked Chicken Thighs with Lemon and Garlic! I also love these Shrimp Fajita Bowls from Skinnytaste. Zucchini lasagna is a low-carb, gluten-free meal that's packed with flavors and textures. You’ll never miss the lasagna noodles! Preheat the oven to 350 degrees F. Line 2 baking sheets with foil or parchment and spray lightly with cooking spray. Place the zucchini in a single layer. Roast for 10-15 minutes, then remove from the oven and transfer to paper towel-lined plates or cutting boards to drain away any excess moisture while preparing the other ingredients. Also blot the tops dry as needed. In Dutch oven or heavy bottom saucepan set over medium-low heat, brown the ground beef for 5-7 minutes. Drain the fat through a colander. In the same pan, heat the olive oil. Cook the onions until soft and lightly browned around the edges, 3-5 minutes. Add the garlic and thyme, then cook for another 1-2 minutes. Return the meat to the pan along with the marinara sauce, and stir to combine the ingredients. Remove from the heat and set aside. In a large bowl, stir together the ricotta, eggs, 3/4 cup parmesan, 1 cup mozzarella, oregano, 1/2 teaspoon of salt and 1/4 teaspoon pepper. Grease a 9x13 inch casserole dish (or similar size) using olive oil or cooking spray. Spread 2 cups of meat sauce on the bottom. Top with approximately 10 slices of zucchini. Top with half the cheese filling, spreading evenly. Top with 1 cup sauce, a layer of zucchini, the remaining cheese, a layer of zucchini, and the remaining sauce. Sprinkle the remaining parmesan and mozzarella evenly over the top. Bake until the the cheese is bubbly and the edges are darkening up, approximately 50 minutes. Allow to set for 20 minutes before slicing. Serve warm. This zucchini lasagna will keep in the refrigerator, covered, for up to 5 days. If you plan to keep leftovers, I recommend slicing portions within 3 days, and storing in individual freezer containers or individually wrapped in a large freezer bag. I used a mandoline to slice the zucchini quickly and evenly. The first time I prepared this, I used 5 zucchini and 12 slices of zucchini per layer (see photos), which still led to a small amount of water pooling on the plate. The second time, I used 4 zucchini and 10 slices. It eliminated the water issue, and you can’t tell the difference in the amount of zucchini. 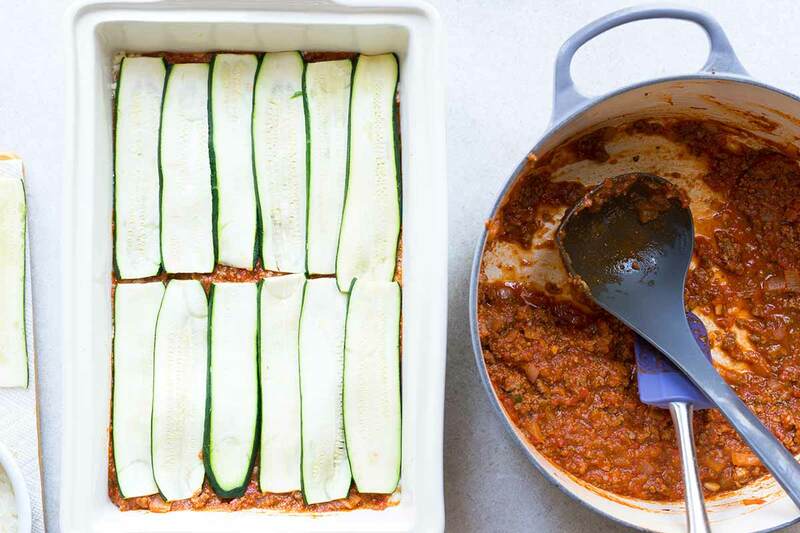 Don’t be tempted to skip the zucchini salting and roasting; you want to remove as much liquid as possible from the zucchini to keep it from seeping into the lasagna. Excess liquid will pool onto your plate after slicing (which can be dabbed away with a paper towel, but it’s nicer to avoid it). Since this recipe already has several steps, I like to save time by using use store-bought marinara sauce. It’s slightly pricer than other brands, but I love Rao’s Homemade Marinara Sauce. It actually tastes homemade. You can use your favorite brand. You could also use my homemade meat sauce. The lasagna can be assembled the day beforehand and then covered and refrigerated until ready to bake. You may need to increase the bake time slightly, since the ingredients will be chilled. i tried this today and it was SO DELICIOUS! i’ll admit that your method for drying the zucchini is quite time consuming, but BOY WAS IT WORTH IT! it didn’t turn out watery whatsoever! i even added extra layers of zucchini (i think i did 4-5 layers total), and barely any water at all! i have lost 40 lbs on keto since June and will def be adding this recipe to my favorites!